The Circus was in Manchester last week. 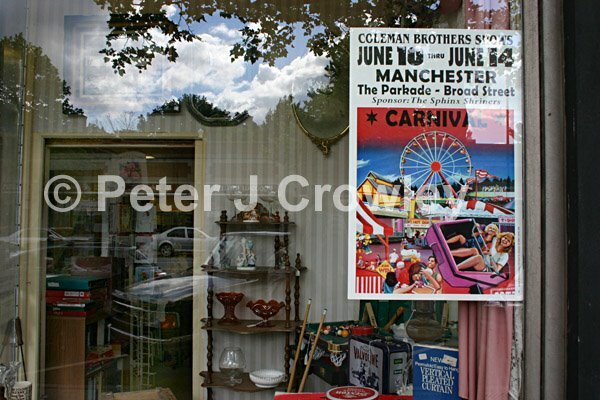 I didn’t go but did shoot this poster in the window of an Antique Store as part of my Layered Life Portfolio. The Big Top itself is becoming an antique, a memory of times past. Manchester is one of a number of places I have called home. One of the old roads where my creative vision began. Guess what? The night of the circus, it didn't rain…but it washed out Third Thursday. What is this world coming to?? May I once again point out the brilliance of my theory that carnivals, et al create rainclouds because of all the metal gear on the rides, cages, etc? It has to be true!